WHAT IS NEXT? FIND OUT HERE! I spoke with the artist Rob Dumo today and everything is looking good. We will be working on the project with the anticipation of having the comic finished by or before the end of January. 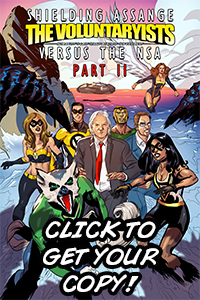 The comic should be sent soon thereafter in .pdf. Those who got the printed comic will get it shortly after that because I have to send the files to Ka-Blam for printing then shipping etc. 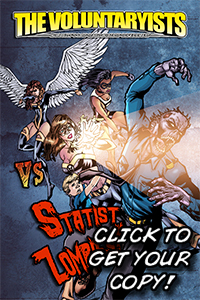 The full funds from the campaign will be released in about 1 week, but we will begin working a.s.a.p. Non-comic perks should be mailed out once the funds disburse, so hopefully the week of November 26th they will be sent. Those who ordered t-shirts will be getting them sent from Meg McLain. I took care of t-shirt orders as they came in. 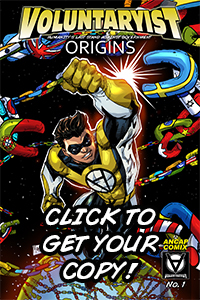 I will be posting the entire origins story with the additional Suit Saga portion in a .pdf, so you will be able to download and read the entire story compiled. 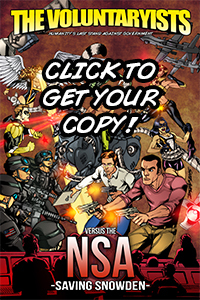 (The .pdf will be hosted here on the http://volcomic.com Website). For updates with images/pictures/news, please check back at this site. I will use the indiegogo.com site for crucial updates. (Ex. Release dates/shipping dates/.pdf release). Thank you so much to every person here again! This was only possible because of you. 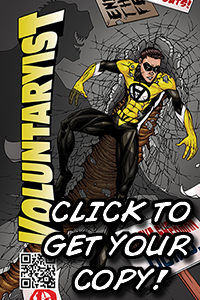 It’s incredible what you have done to bring Voluntaryism into comics and how much we can shape the world for liberty through this medium! I look forward to keeping you up-to-date and to pursuing a freer future with you.